Common and widespread. The most abundant species of the genus Lycopus. Wet or moist. Marshes, wet meadows, fens, stream banks, ditches, lake shores. 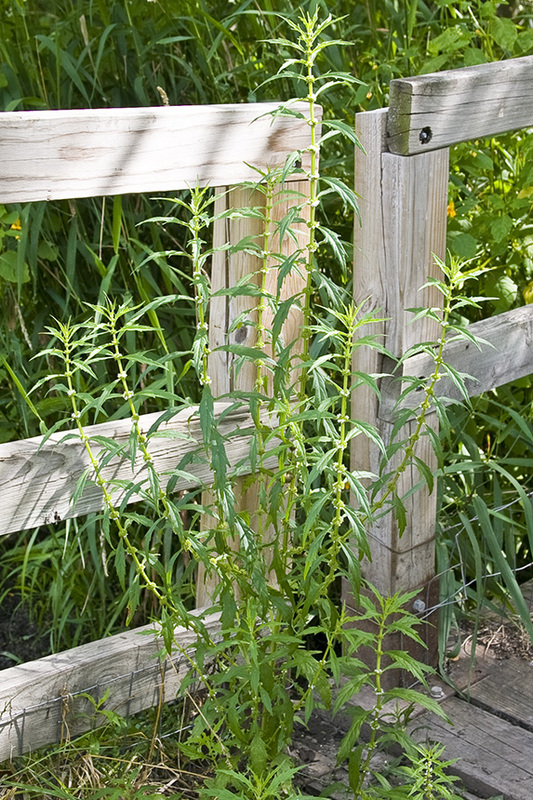 This is a 4″ to 40″ tall, erect, perennial forb that rises from a long, horizontal rhizome and fibrous roots. The rhizome does not have tubers. The stems are erect, branched or unbranched, green, square, hollow, and hairless except for tufts of hairs in the leaf axils. They are weak and may sprawl without nearby supportive vegetation. There is a single vertical groove on each side of the stem. The leaves are opposite and variable in shape. Each pair of opposite leaves is at right angles to the leaf pairs above and below it. 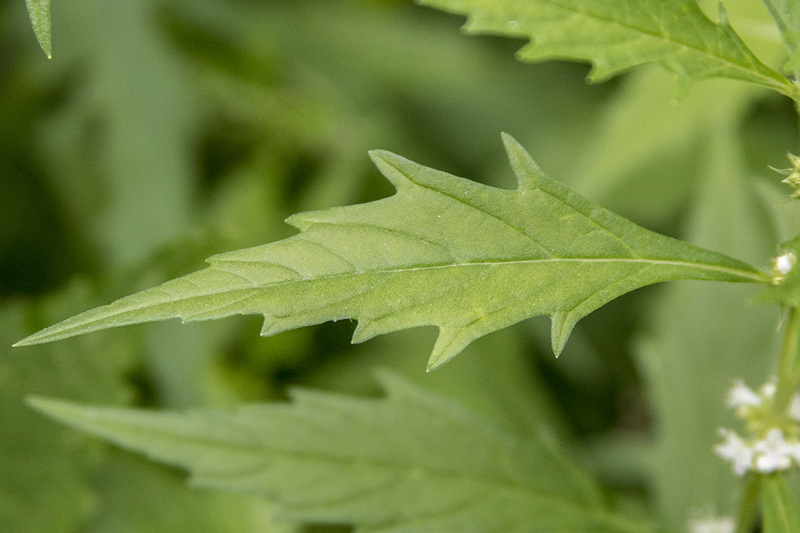 The leaf blades may be lance-shaped or narrowly oblong to nearly linear. They are 1⅛″ to 3⅛″ long and ¾″ to 2¾″ wide. They taper gradually at the base to a short leaf stalk and taper at the tip to a narrow point. The lower leaves are deeply and irregularly lobed near the base, deeply toothed near the tip, and short stalked. They become progressively less lobed, less deeply toothed, and shorter stalked as they ascend the stem. 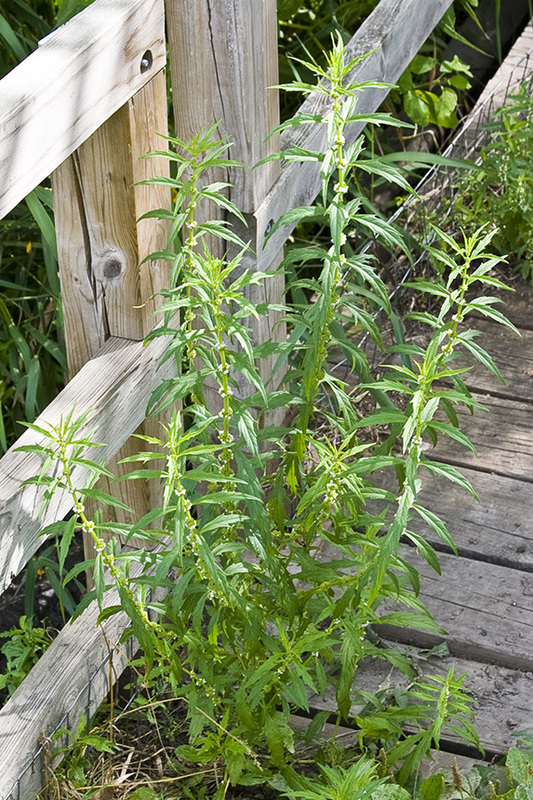 Upper leaves are coarsely toothed, unlobed, and stalkless. The upper surface is hairless. The lower surface is hairless except for short hairs along the veins. Although this is a mint, when crushed the leaves do not smell of mint. The inflorescence is a tight cluster of 10 to 26 stalkless flowers in the leaf axils on the upper ⅔ of the stem. Pairs of clusters in opposite leaf axils form false whorls. There are 5 green sepals (calyx) that are united for most of their length into a 1 ⁄16″ to ⅛″ long, bell-shaped tube with 5 teeth. The calyx teeth are 1 ⁄16″ to ⅛″ long, firm, sharply pointed, narrowly triangular, and more than twice as long as their base is wide. There are 5 white petals (corolla) that are united at the base into a tube that is barely longer than the calyx tube, and are separated at the tip into 4 spreading lobes. The upper lobe is notched at the tip and is broader than the lower and lateral lobes. The petals are sometimes spotted with pink or purple. There are 2 fertile stamens with brown anthers and 2 sterile stamens (staminodes). The stamens and the style are barely longer than the corolla tube. The staminodes are club-like and are shorter than the corolla tube. The flowers are not fragrant. The fruit is a set of 4 egg-shaped, brown, hairless, ridged nutlets with one seed each. The inner angle is shorter than the outer ones so that the center of the nutlets is depressed. When the fruit is mature the calyx lobes surpass the nutlets. See the Lycopus ID Filter for a spreadsheet to aid identification of this and similar species. Northern bugleweed (Lycopus uniflorus var. uniflorus) produces a stolon with a tuber at the tip. The leaves are shorter and are not lobed. The calyx teeth are shorter, no more than 1 ⁄32″ long. The corolla has 5 lobes, not 4. When the fruit is mature the nutlets surpass the calyx lobes. Rough bugleweed (Lycopus asper) leaves are not lobed. 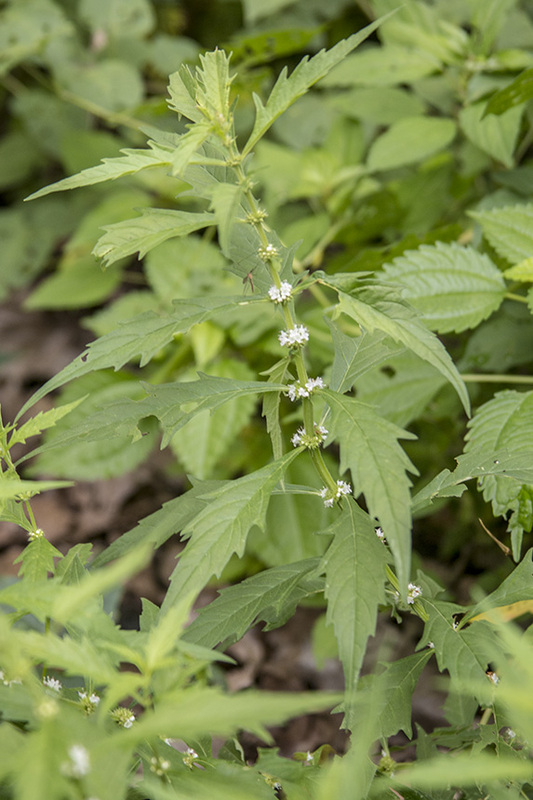 Sherard’s waterhorehound (Lycopus X sherardii) is a hybrid between northern bugleweed and Virginia bugleweed. It is found wherever the ranges of the two species overlap. Virginia bugleweed (Lycopus virginicus) leaves are hairy on the underside and are not lobed. The calyx has 4 teeth, not 5. The calyx teeth are shorter, no more than 1 ⁄32″ long. When the fruit is mature the nutlets surpass the calyx lobes. A modified stamen that produces no pollen. It often has no anther. MNEMONIC EXPLAINED: When you see a human spine (represents main stem: 1. both are erect. 2. leaf pairs are widely and evenly spaced along stem; spine look. 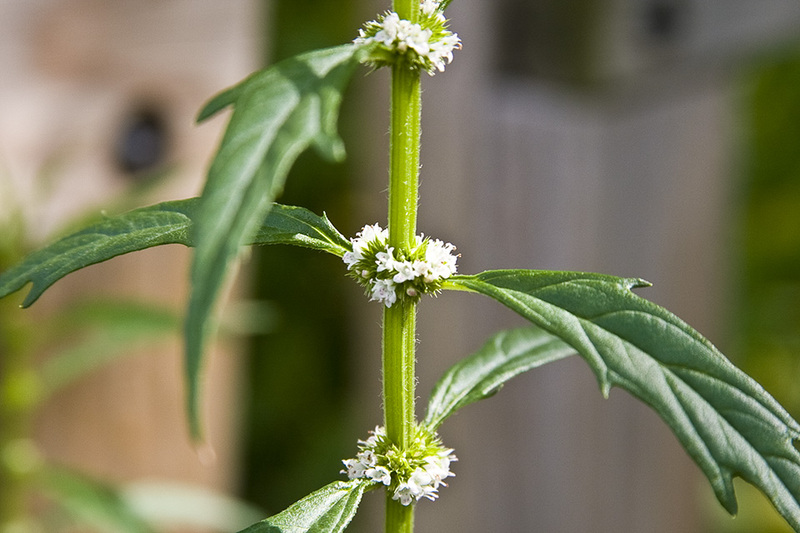 3. tiny whitish to pinkish flower clusters encircle stem where leaf pairs meet the stem, like whitish to pinkish cartilage between each spine disc or joint. 4. spine/stem is hollowed after scavengers picked it clean; now there's only bone. 5. each spine disc, from a top view, is rectangle-ish NOT round [especially if you choose to imagine each spine disc with it's vertebra attached]; the stem is not round either, it's square. 6. a human spine, like the stem, can be up to 3 feet tall) coming out of the ground. Upon closer examination (naturally you should examine the leaves next; the flowers were already recognized as whitish to pinkish cartilage) you notice that some dog features remain at the top and bottom (here it helps to remember the phrase "examined from top to bottom; this brings you to the head of the dog then to the feet) of the carcass. The ears (leaves grow opposite along stem in pairs; like ears on a dog's head), teeth (upper leaves are coarsely toothed) and feet (you're finished with the top or head of the dog, now for the bottom or feet) are like those of a wolf (lower leaves, mainly in the bottom half of the blade, are deeply lobed and lobes end in points [represent dog claws]; Lycopus comes from the Greek words lycos for "wolf" and pous for "foot", apparently an imaginative referral to the shape of these bottom leaves). This was a wolfman!!! The cause of death is clear. Someone put a spear (leaves are lance or oval-lance shaped) right through the middle of the wolfman's back (leaf pairs are arranged perpendicularly to the pair above or below it; forming the shape of a "cross" or "X" from a top view; the wolfman's ears and arms represent east and west leaf pair alignment; the spear, through the wolfman's back, represent north south leaf pair alignment; the spear going through the "middle" of the wolfman's back, represent that north south pair of leaves lying on a different plane than the east west [ears and arms] pair) as it was kneeing down (reason for low spine position above ground; up to 3 feet tall) to drink water (this plant is found in damp or wet environments). OPTION: Leaf pairs are arranged perpendicularly to the pair above or below it; forming the shape of a "cross" or "X" from a top view. Remembering this top view can reinforce the plant's square stem characteristic. 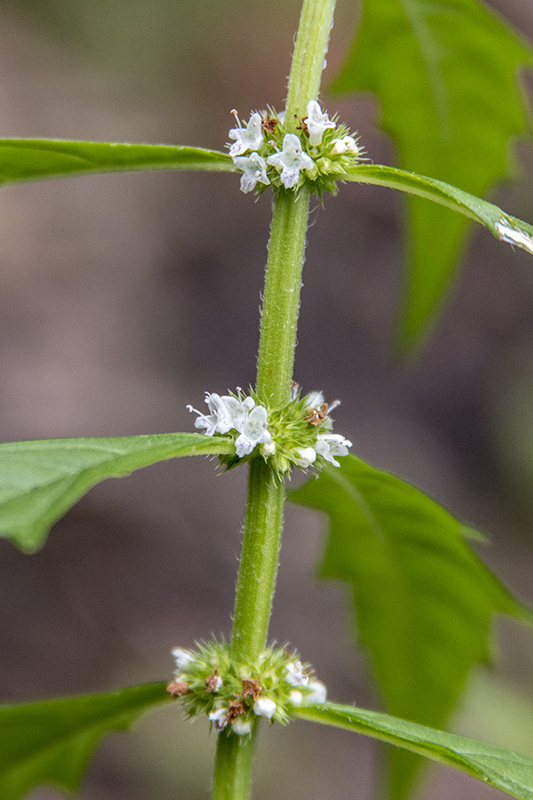 http://www.learningherbs.com/ The bugleweed is featured in this harvesting herbs video. 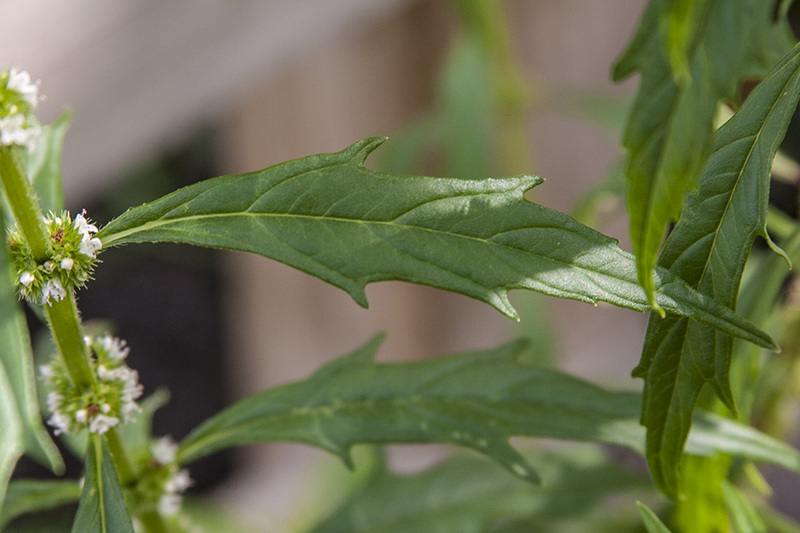 Learn about growing herbs, particularly the Lycopus virginicus or the bugleweed herb, in this growing bugleweed video.